Given the benefits of sharing across organisational boundaries, we’ve pulled together our key learnings from running a Collaborative for anyone who wants to set up a light-touch Collaborative of their own. If you want to run or join one and need help, it’s worth contacting your local Academic Health Science Network. 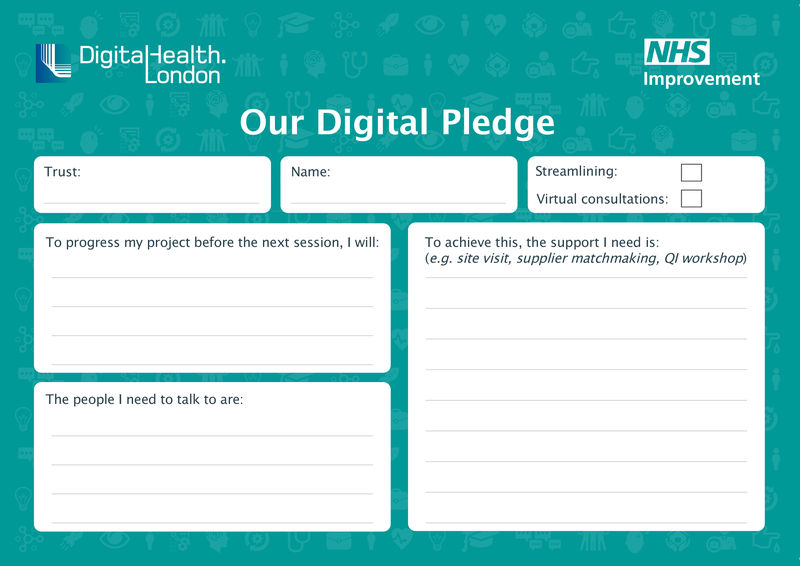 One of the unique features about the Digital Outpatients Collaborative was that the projects that Trust teams brought to work on were all very diverse – both in terms of subject matter and how far along the project had progressed. This meant that our programme, while based on the IHI breakthrough collaborative model, was very flexible and very much driven by the Trusts, where the Collaborative team sought feedback and requests at every stage to ensure the programme was delivering what the project teams needed. What did the Collaborative consist of? The Collaborative ran from March to June 2018 and was based on the two main themes that Trusts had highlighted at a previous Conference on this topic, held in Autumn 2017. The work was sponsored by NHS Improvement and consisted of four workshops, coaching and project support to teams over a four-month period, with around 50 participants from 16 London Trusts. Most were acute trusts but there was also a specialist trust (Moorfields) a mental health trust (West London Mental Health) and a combined community and mental health trust (Oxleas) participating in the collaboratives. The events consisted of talks from subject matter experts, expert clinics on topics such as information governance and quality improvement methodology and tools; advice on how to communicate project successes and how to spread and upscale any improvements; as well as networking opportunities and the chance to speak to other Trusts facing similar challenges. Support provided in between workshops consisted of facilitation and co-ordination of intra-site visits, resource sharing and site visits to support with process shaping. It took the form of telephone support plus visits to trust sites. In early June 2018 we held the final showcase day with Trust teams presenting their findings to NHS Improvement’s Regional Director, Steve Russell and Director of Improvement Programmes, Bernard Quinn. The Trusts we worked with all cited the opportunity to learn from each other as the biggest benefit from taking part in the Collaborative. Time and time again, the feedback from Trusts was that they highly valued the opportunities to meet with other teams and to network for future ideas sharing. Most participants talked about their willingness to engage in similar collaborative working in the future. Hillingdon said that they were very willing to share what they had achieved and referenced the idea of ‘stealing with pride’, citing that learning from others had been key to their project and meant that what had taken another Trust 18 months to implement, had only taken them 3 months thanks to the other Trust’s willingness to share. St. George’s talked about how helpful it was to see that digital solutions are being successfully implemented elsewhere, and that while it’s important to recognise the different contexts and environments at different Trusts, there is something very reassuring about hearing about the success of others working on similar issues. Likewise, West London Mental Health Trust said that the collaboratives “helped them not feel alone in the process”. We ran four workshops over four months, led by project managers with experience in outpatient redesign and digital solutions respectively. The workshops included talks from subject matter experts and expert clinics on topics such as information governance and quality improvement methods. We also used the workshops to share tools and advice on other aspects such as scaling improvements quickly and communicating project successes. The workshops were great networking opportunities, offering the chance to speak to other Trusts facing similar challenges. Speakers included subject matter experts such as Bob Klaber, a paediatrician and QI lead at Imperial, Shanti Vijayaraghavan, consultant in endocrinology and metabolic medicine at Barts Healthcare and Toby Garrood, an outpatient redesign lead and consultant rheumatologist at Guy’s and St Thomas’ NHS Trust. The Collaborative team (consisting of experts from DigitalHealth.London and the Health Innovation Network) provided additional support on request in between the workshops. This included site visits to support with process shaping, alongside telephone support throughout and use of Slack for ease of communication between workshops. For example, the DigitalHealth.London team visited Oxleas in May to provide face-to-face support with process mapping, which they used to redesign their information gathering at the service’s reception. We learnt that what works for some Trusts isn’t right for others. Teams wanted varying levels of interaction with the Collaborative team, some of them opted for site visits, others for phone calls and email support, and others were content with just the participation in the workshops as this provided dedicated time for their project teams to get together. Remember to tailor support for project teams and recognise that not all Trusts are the same. While some Trusts wanted to do PDSA cycles, other tools were more relevant for others, such as the stakeholder mapping and process mapping worksheets, which many Trusts cited as useful. At the second session, we also introduced Life QI as a great tool for planning, executing, measuring and communicating about projects. Life QI is an online quality improvement (QI) platform that supports NHS teams to plan, monitor and report progress of their improvement projects, as well as connect with other members of the QI community. It is available to all Trusts through their local Academic Health Science Network (read more here). Trusts were encouraged to upload details of their projects on the platform to allow for wider sharing, as the platform allows users to search for similar projects using keywords, provided the projects have been made visible. St. George’s is just one of the Trusts who cited the resources as an element they had benefitted from taking part in the collaboratives, saying that “the PDSA cycle template, Life QI and Slack have been really helpful for bringing better structure to our prototyping”. At the first workshop, we asked all participants to fill in pledges with what they were committing to do before the next workshop, as well as a kind of ‘wish list’ for the support they wanted from us. We collected the hard copy pledges then went away and designed the future workshops with these requests and feedback in mind, meaning that the programme was customised to the specific Trusts which were participating in the programme. This was key to the programme’s success and allowed us to address particular challenges. Explore the resources we shared with Trusts in full here. Read reflections from Louise Molloy, Outpatient Improvement Programme Manager, King’s College Hospital NHS Foundation Trust, on running a Collaborative.